Gujarati snack recipes. Gujarati farsan recipes. Just like Kareen Kapoor says in 3 idiots, “.. dhokla, fafda, handva, thepla ... aaise lagta hai jaise koi missiles hai” , we would like to say they are utna he tasty and easy to make! Deep-fried snacks like Methi Makai Dhebra, Vatana ni Kachori and Ghughra are a perfect accompaniment to a cup of masala chai and a part of the infamous Gujarati thali which is a grand feast. Fluffy, soft Khatta dhoklas made by grinding and fermenting homemade flour using urad dal and rice is easy to make and a must try recipe! The dhoklas can be eaten with ghee/oil, green chutney or garlic chutney. A sprinkle of red chilly powder or black pepper before steaming simply enhances the flavour. You can even make Khatta dhoklas using idli batter , they are quick to make. Using the same batter, you can make Handvo, a delicious snack loaded with crunchy vegetables. Other than that you can even make nutrient-rich Mag Na Dhokla, Methi Palak Chawli Dhokla made with the goodness of green leafy vegetables and chawli, Sprouts Dhokla, Chola Methi Dhokla , these are some wholesome breakfast options. Looking for an instant dhokla recipe? Try making Rava Dhokla, Corn Dhokla, Poha Dhokla or Bread Dhokla that requires no soaking and fermenting and can be whipped up in no time at all. This spongy , melt-in-the-mouth snack is loved by all! Panki, a popular Gujarati snack is a very thin pancake made out of any type of flour mixed with curds and lightly spiced with cumin seeds, green chillies and ginger. As you may have guessed, the name originates from the word paan or leaf, and this snack is actually cooked between two well-greased banana leaves. The leaves impart a special rustic flavour to the pankis. These delicate pancakes are light on the stomach and ideally eaten fresh with tongue-tickling chutneys. Make these delectable, steamed Moong Dal Panki, Green Peas Panki, Corn Panki. Most Gujarati’s observe fast during Navratri that includes having a proper meal just once in a day and eat faraal food for one meal or eat faraal both the time. Potatoes, kaand, peanuts, sago and flours, sanwa millet, buckwheat are popular ingredients. An array of dishes can be made by combining these ingredients. Sanwa Panki, Buckwheat Dhokla, Faraali Pattice, Khandvi are famous Gujarati Faraal farsans. This section introduces you to traditional treats like Patra, Nylon Khaman Dhokla, Khandvi, Methi Na Dhebra, Moong Dal Dhokla, Dakor Na Gota etc. 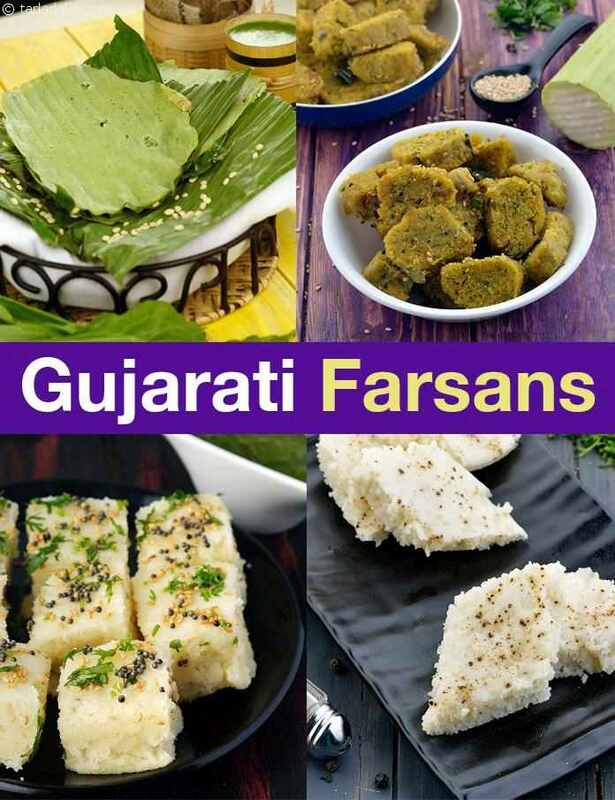 Enjoy our Gujarati Farsan Recipes, Gujarati Snack recipes and Gujarati Recipe articles below.